Local community groups, voluntary organisation representatives, young people and residents took part in a Community Conversations event at Marsh Farm Futures (MFF) on Tuesday 30th October. The event was opened by Anna Pedersen – Chair of Marsh Farm Futures Board who welcomed and thanked everyone for coming out on a cold Tuesday evening. Speaking to attendees at the event, Anna said: “I am extremely grateful for your attendance this evening and look forward to supporting you with Community Business and your ideas”. Ishaq Kazi, Programme Manager at MFF running the Power to Change Project said “we are one of seven organisations in the country to have been selected by Power to Change, an independent Trust. The key purpose of the programme is to engage residents and develop ideas to set up community businesses that will be owned, run and managed by local people”. 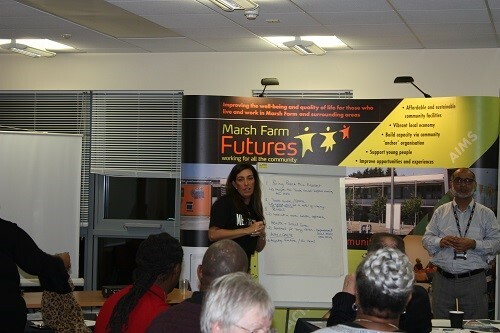 Over 25 people attended the event hosted by MFF at Futures House. During the event, MFF raised awareness about Power to Change and the Empowering Places Programme focusing on community business. Annette White, a Director of MFF who is overseeing the programme said “It’s great to see our local residents come up with some superb ideas and show huge enthusiasm. I want to reassure everyone that community businesses will address local issues as they are responsive to change, they help their whole community recycle money back into the local area and they give the power back to their local community”. The event provided an opportunity for participants to generate great ideas including recycling furniture, community energy, community market stall and an online disability shop. Hi it’s me, I am also visiting this website on a regular basis, this web site is genuinely good and the people are genuinely sharing good thoughts.